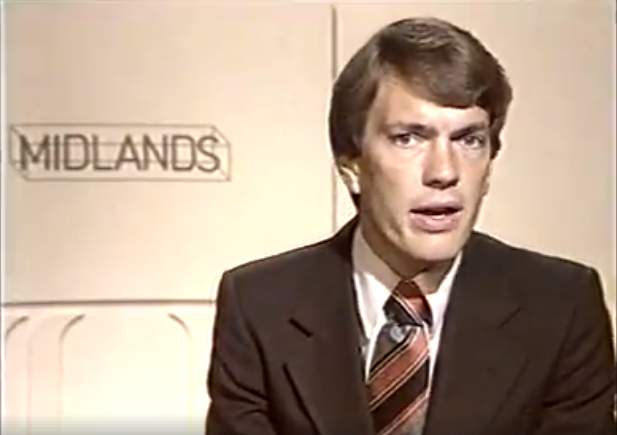 A Midlands News broadcast, presented by Alastair Yates, from 1979. Alastair left Pebble Mill for Grampian in 1980. The broadcast had been recorded by Chris Howles on a Philips N1700 format tape, and donated to TVArk. The prompter seems not to be working at the beginning of the broadcast, with Alastair doing a wonderful job of reading off the script, whilst looking up from time to time. The cartoon over the weather seems very odd, and then the prompter seems to be working properly after that. The news seems to consist of a litany of crime, followed by a list of what’s on in every single theatre in the region! This was one of the last ‘closedown’ broadcasts to be done from the Midlands, due to an economy drive! Nothing new about BBC cut-backs! Thanks to Chris Howles for bringing the clip to my attention. Worked with Alastair for a bit at Grampian ….. Top Man !! Thanks for showing this. It was indeed 1979 before the axe fell on the Presentation Dept at BBC Midlands. I was very sad to leave Pebble Mill but it opened doors for me to start my course towards international journalism. I arrived in Aberdeen to shadow Selina Scott on one of her reporting assignments and soon became her co-presenter on North Tonight as it expanded to 5 nights a week. From the North of Scotland I returned to England to take up a post at Anglia TV in 1986. BBC World Service TV was expanding in 1991 and I decided this is where I needed to be. BBC News 24 launched in 1997 and I was part of the team. Deutsche Welle TV enticed me over to Berlin for a couple of years but I re-joined BBC World in 2001 where I stayed until retirement in 2011. Thanks for your comment, it’s interesting to hear how your career developed after your time at Pebble Mill. had the pleasure of producing AY on Radio Birmingham morning show—Joan Collins stormed out on him and achieved the station’s only ever national headline.